Please help make sure the Austin Parks and Recreation Department (PARD) doesn't overlook greenspace for our neighborhoods. PARD is currently in the midst of its long range planning process. The City has designated several portions of our neighborhoods for possible Vertical Mixed Use (VMU) development. We believe that VMU town centers will be livable and sustainable only if accompanied with sufficient open space (plazas, courtyards, parks, and the like). To protect our neighborhoods, we want to ensure that PARD designates the VMU town centers along streets like Burnet, Anderson, Lamar and Airport as priorities in their Long-Range Plan. You can help. Please read the letter below and, if you agree with it, add your name to our list of signers. To sign the letter, send email to szettner@austin.rr.com with your name and either your neighborhood or a title you would like to use. PARD had public input meetings for North Austin (including North Shoal Creek, Wooten) Wednesday, April 22. The next public input meeting will be on Wednesday, April 29, and will include Allandale, Brentwood, Crestview, Highland, and the rest of Central Austin. 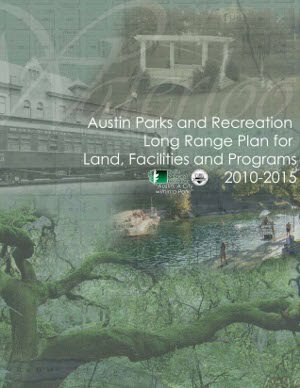 Details, including a draft of the long-term plan, are available at http://www.ci.austin.tx.us/parks/longrangeplan.htm. Thanks so much for taking a bit of time to shape a positive future for North Central Austin! We would like to propose changes, detailed below, to the PARD Long Range Plan in support of the population centers that have been zoned along the City's transit corridors. PARD has done an admirable job of defining the need for open space in support of Transit-Oriented Development (TOD). We would like the document to recognize explicitly the existence of places along transit corridors, i.e. areas zoned for Vertical Mixed Use near where the City is likely to place MetroRapid stations or other robust transit centers, and to state that such places need to be supported with open space in the same way and for the same reasons as TOD. Both Vertical Mixed Use zoning and planning for MetroRapid lines have emerged recently. Most neighborhood plans were completed prior to these planning processes. Other neighborhoods impacted by VMU and MetroRapid do not have neighborhood plans. Input on the need for open space at what we would call "VMU town centers" was provided in April 2008 as part of the PARD public input process. However, since that time public awareness and support for this issue have increased greatly. The changes we propose are fully consistent with PARD goals of accessibility and sustainability. To reinforce the goal of sustainability, we propose adding an objective that recognizes the value of parks, plazas and trails to increase use of sustainable forms of transportation - walking, biking and public transit. We applaud PARD for a transparent public input process and for goals that will ensure that our public parks and facilities offer the greatest value to the people of Austin. "Vertical Mixed Use (VMU) and Transit Corridor Transportation Planning - Vertical Mixed Use zoning was added along transit corridors in the central areas of the City in 2007. CapMetro is planning MetroRapid lines along some of these same corridors. Future modes may include light rail. Areas zoned for VMU near where transit stations are expected have open space needs similar to those described for TOD's." "Other trails that connect TOD, VMU, or other higher-population density centers." "Plazas - ensure functional open space in support of high pedestrian-traffic flows, especially near transit stations, in partnership with both public and private entities." "Transit Oriented Developments, including VMU-zoned areas near future transit stations along transit corridors"
2.1 Pocket Parks. Change language "(Transit Oriented Development, Vertical Mixed Use, etc)" to "Transit Oriented Development, Vertical Mixed Use, or other areas with concentrated multi-family housing)"
Note - this same language would need to be changed at several other places in the document. "8) Park and trail arrangement can increase use of sustainable forms of transportation." Certain places zoned for Vertical Mixed Use along Transit Corridors share the same goals and needs as TOD districts, especially at major intersections where one can expect siting of MetroRapid or even Light Rail stations. In the absence of formal plans for these areas, TOD criteria for open space will be applied." Where ever possible, park trails should be added where they connect higher-density population centers, for instance TODs or VMU districts. These trails will get above-average utilization and will contribute to PARD's goal of sustainability by encouraging eco-friendly transportation."